This is incredibly cool. Also, given the Internet's proclivity for dousing good intentions in gasoline and setting them on the troll-iest of fires, a little bit crazy. Ryan Carter has wired his real-life Christmas tree to sync up one-to-one with his elaborate Minecraft holiday setup. 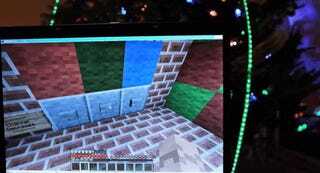 Using a series of switches and a ton of redstone, he's created an in-game tree whose colored lights can be controlled with simple button presses. You can even mix and match color combinations to make the lights go outside the typical red-green-blue spectrum. Each time anyone does this, Carter's corresponding real-life Christmas tree reacts in kind. If you want to join his Minecraft server and light up his life (or annoy him to death with ceaseless flickering because, again, Internet), you can do that here. You'll also find a live feed of the real tree so you can see what other people are having it do.